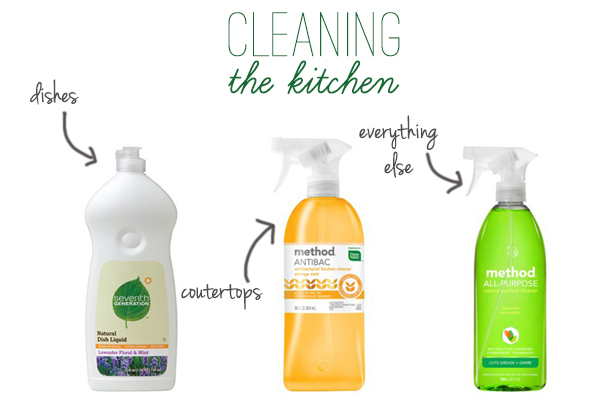 My guest post for Grace this week got some people asking me about my natural cleaning products. Instead of writing a really freaking long post that you won’t even read, I decided to split it into rooms. I think this makes me most sense. I try to keep it simple, especially in the kitchen, because sometimes I am lazy. Sometimes is code for most times so if I had too many steps, it would not happen. This is the best dish soap next to Dawn and since I don’t use Dawn or even look at it with a side eye, we use this. It is good. you should use it. I may or may not be a germaphobe so I love that this method cleaner is antibacterial I use this shiz all over the counter tops and it works well to clean the stove because it cuts grease. As far as other surfaces (cabinets, coffee makers, oven doors, dishwasher doors, toaster ovens) are concerned, I use the all purpose cleaner. See, its not so bad. Right? If nothing else, just use the green cleaners because they smell better and have prettier packaging. I use seventh generation dishwasher detergent – it’s great. I also use seventh generation free&clear laundry detergent and like that. For dish soap I use Meyer’s Lemon Verbena… the smell is amazing! I really like Mrs Meyers products but I find the prices akin to highway robbery for the actual performance. Love this post! If you’re interested in trying something new – definitely try out the Mrs Meyers’ Clean Day Dish Soap in Basil. I promise you, it will make washing dishes a lot less heinous than usual. Didn’t notice Lauren’s comment before mine (woops) – basically all of Meyer’s products smell like heaven. Seventh Gen and Method are my jam, but I agree with the above about Meyers. Nothing smells bettah. I love everything method. The dishwasher tabs are the best ones out there right now! Okay I was wondering about some of these. Thank you for the heads up!! Ha, we use the same products. Speaking of cleaning the kitchen I really need to steam the floors. Ugh. I’ve recently started using green cleaners. Mrs Meyers is where its at. The all purpose cleaner is 7.99 but it is meant to be diluted! I add one tablespoon to a spray bottle filled with water and that’s all I need. So in the end it’s less expensive.